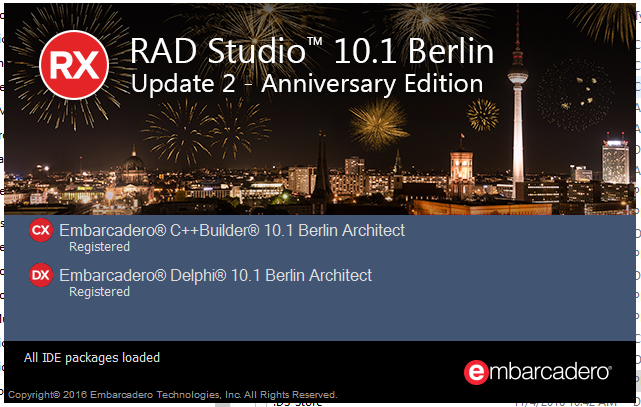 Embarcadero released today the second update of RAD Studio, Delphi, and C++Builder 10.1 Berlin, with significant new features (mostly focused on Windows 10 Anniversary Update) and quality improvements. The features were announced in last week webinar available as a replay at https://www.youtube.com/watch?v=TvUJXJDhF4E and include support for Windows Desktop Bridge deployment in the IDE, a new CalendarView control, new designers called QuickEdits, and much more. You can read a detailed description of these new features in the docwiki help page at http://docwiki.embarcadero.com/RADStudio/Berlin/en/Subscription_Update_2. The update has also several quality improvements and bug fixes, including the most voted issue on Quality portal, the problems with CodeInsight and static arrays. Other notable fixes include dynamic arrays optimizations (following regressions in Berlin), DataSnap issues, several DBGrid regressions fixes, C++ compiler improvements, REST clients calls with compressed data on mobile, and many others. You can find the list of publicly reported bugs fixed in this update at http://edn.embarcadero.com/article/44726. Notice that if you want to preserve your registry setting in this uninstall/re-install cycle you should use the same installer technology of your most recent install. Before you ask, the GetIt based installer this time will ask you if you want to preserve your registry settings, and would make a copy and reapply them after the installation completed. Hope you like the quality improvements and new features of Berlin Update 2. And stay tuned to CodeRage today and the coming two days. There is no longer direct ISO download, +Marco Cantù? installation worked fine using GetIt installer. - Good to see that the SetLength regression is fixed! - I have to reinstall all my packages? and is a real showstopper for our development! How can i know which installer i had used in the past ? require you to recompile your code or reinstall components. annoying but not worth delaying the release. available only if you used the GetIt installer. Just downloaded the iso, burned and installed. at all. Nice job guys! which installer was used. Not that big of a problem for me. It's not a big problem for me, but only FYI. are reporting the test case for the issue still fails with update 2.
still have the issue, let see if this is a general problem or not. operation. How can I resolve this? workarounds. But the same is true for Delphi and C++Builder, afaict. ""- there is really no other way to do a mayor update. potential customers updates to files is not an option""
Please spend time into making it an option,. renewals if this keeps up. There is problem regarding install procedure. manually and re-install the update again. rollback to Update 1 to continue work. "Does not support current OS version"
Installer on Windows Vista or Higher". Then the install quits. It doesn't say what MS SDK is used for or how to fix the problem. Apparently it thinks I'm running XP. 1) So do I have a working version of Delphi installed or not? 2) Is there a log file to indicate what failed to install? 3) How do I fix this problem? Do I need to wait for 10.1 Update 3? root canal than attempt to install a new version of Delphi. Downloaded the radstudio10_1_upd2_esd.iso and cannot install. Using Win 10 or other iso runners. No joy. Got it from radstudio10_1_upd2_esd.iso on the URL link. "The style of the INF is different than what was requested"
the name correctly, and then try again." "This app can't run on your PC"
"To find a version for your PC, check with the software publisher." Must I download it again? even that something got messed up in the ISO file, but quite unusual. access, I order the $35 or so "media kit" with my subscription. take time and download allowance. match the MD5 reported for the ISO from the download site. been released just to FIX the bugs of 10.1 version!!! for a buggy product that I duly purchased! and of their policy for customers. they may have reworked the CodeInsight function. allows me to work fast would be VERY inportant. me. When I installed it, I had only win 64 support enabled, no mac. that point and have with that no mac osx support.